-Failure to appear at appointed place of duty. -Disrespect of a commissioned officer. -Disobeying direct order from superiors to wear the proper uniform. Appellant did not inform the person who ordered her to remove the signs that they had had any religious significance to Appellant, the words in context could easily be seen as combative in tone, and the record reflects that their religious connotation was neither revealed nor raised until mid-trial. Nor, despite the existence of procedures for seeking a religious accommodation, did Appellant seek one. This decision was upheld by the U.S. Court of Appeals for the Armed Forces before being appealed to the U.S. Supreme Court for review. On Monday, June 5, 2017, certiorari was denied and the U.S. Supreme Court refused to further review the case of Sterling, Monifa J. V. United States. FoxNews.com reported that Kelly Shackelford, CEO and chief counsel for First Liberty Institute which represented Sterling, said in a statement that “the travesty below by the Court of Appeals for the Armed Forces will now stand”. In its original 4-1 opinion, the U.S. Court of Appeals for the Armed Forces turned away Sterling’s case stating that “We reject the argument that every interference with a religiously motivated act constitutes a substantial burden on the exercise of religion,” the court said. 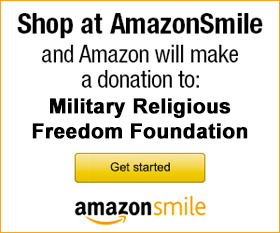 Today’s magnificent decision by the United States Supreme Court to refuse to review the Monifa Sterling case is one of the most monumental watershed victories for military religious freedom against the base, evil, and vile tyranny of fundamentalist Christian oppression in the history of the United States Armed Forces. The specious arguments of amicus briefs filed by fundamentalist Christian hate organizations as well as their fellow travelers including thirteen fundamentalist Christian retired military generals, thirty-six Christian supremacist members of Congress, and even the attorneys general of fourteen conservative/red states were no match for the clear, unadulterated justice that needed to be done here. The Military Religious Freedom Foundation is extremely proud to have been on the right side of history in filing our amicus brief in this critical case for the cause of constitutional freedom. Lady Liberty is smiling today, and the forces of fundamentalist Christian exceptionalism and dominance have been beaten back in a landmark manner. This bad marine is a fraud. Shes definitely not a Christian. I allowed this lair to stay in my home as a favor to a friend….long story short im taking her to court next Wed. She is very DISRESPECTFUL. Hey Tiffany, so you know Monifa? I would like to know more.